Highly-effective cat litter is a must for keeping owners and pets happy in multi-cat households, which is why this Biokat's Diamond Care MultiCat Fresh Cat Litter is exactly what you need. It is an innovative clumping litter, designed specifically for households with more than one cat and super effective thanks to activated carbon and renewable natural coconut shell fibres, known for their odour binding and absorbent effects. Activated carbon is a highly porous carbon compound with a huge inner surface area: one gram of activated carbon would measure around 1000 sq/m if unfolded! The 2in1 Fresh Lock Formula in this Biokat's Diamond Care MultiCat Fresh Cat Litter combines 100% natural activated carbon with an AromaProtect formula. This reliably contains unpleasant odours and releases a pleasant fresh scent in its place. This fragrance comes from blue beads scattered throughout the litter. The fine grains of this litter are dust-free and form flat clumps upon contact with liquids, trapping smells as well as urine. The micro-proceΒing used to form the litter ensures that clumps form fairly uniformly in terms of shape, depth and firmneΒ. 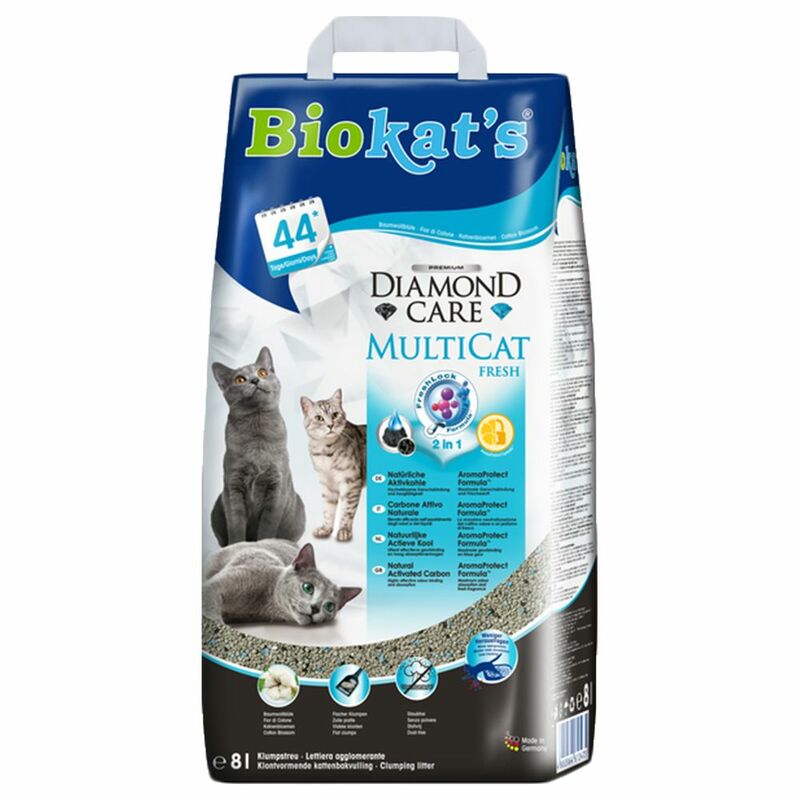 Biokat's Diamond Care MultiCat Fresh Cat Litter is made using 100% natural clay from controlled, environmentally sustainable open-cast mines in Germany. Biokat's Diamond Care MultiCat Fresh Cat Litter at a glance: High-quality cat litter designed especially for multi-cat households AromaProtect formula: locks away unpleasant odours and releases pleasant fresh fragrance in its place Activated carbon: highly effective at containing odours and absorbing liquids Forms flat clumps Exclusively natural clay from approved open-cast mines in Germany Particularly fine dust-free granules that are even suitable for sensitive cats Can be used for up to 44 days Pleasant fragrance: bring a permanent fresh feel with the scent of cotton flowers Made in Germany. Price just £21.99! Click here to buy now!